DUNES ARE PILES of windblown sediment. Geomorphologists refer to dunes and other wind-created features as aeolian landforms. (Aeolus was the ancient Greek god of the winds.) Geomorphologists also refer to dunes as sand dunes, as sand is the most common type of sediment in the deposits. Dunes sometimes include sand-size aggregates of clay, gypsum, or carbonate grains as well. Dunes form when an obstacle (a low hill, rocky outcrop, cluster of bushes or grasses, etc.) slows down sediment-laden wind. Dune development requires a sediment source and a relatively strong wind. Sand dunes form in deserts and along low coastlines. In deserts, winds blowing across dry deflation-prone surfaces supply the sand. Coastal dunes depend on longshore ocean currents to bring sand to beaches, and then steady winds blow the sand inland where the dunes form. In profile view, most dunes consist of three parts: a gently sloping (upwind) back slope, a sharpedged or slightly rounded crest, and a steeply inclined (downwind) slip face. Winds blow up the back slope side of the dune to the crest, crossing the crest at a 90 degree angle. Active dunes slowly migrate downwind as the winds push the sand-size particles up the back slope to the crest, where they slide down the slip face. Large dunes travel a few dozen feet or meters a year; smaller ones move up to 131 ft (40 m) a year. Active dunes quickly smother any vegetation that manages to take root on their surfaces. 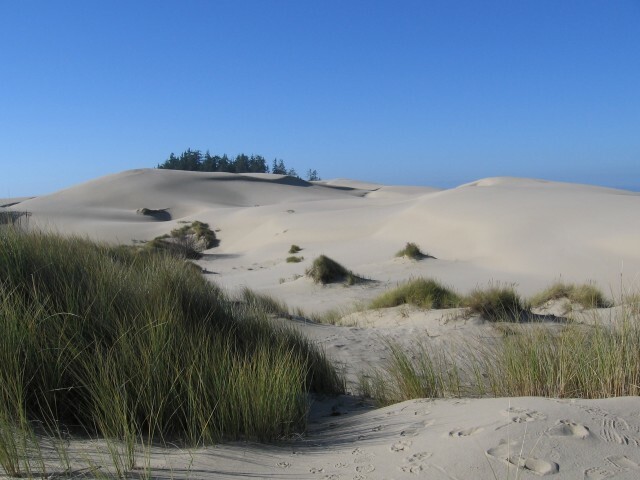 Stabilized dunes are dunes anchored in place by deeply rooted vegetation. Dune stabilization occurs in semiarid and coastal areas where the climate is moist enough for grasses or small bushes to grow on the dunes. Precipitation and dew dampen the sandy surface to make it less mobile and less apt to smother developing vegetation growth. In some regions, climate change from a desert to a more humid climate or a reduction in sand supply accounts for dune stabilization. Anchorage may also be human-induced. Cultivating fast-growing grasses on dunes is one method; people plant the grasses to slow down dune migrations into agricultural fields and check sand from blowing into cities and towns. Artificial dune stabilization is usually only a temporary fix to an inexorable natural process of dune migration. The most common dunes are barchan, transverse, seif, star, and parabolic dunes. The barchan is small dune that migrates across a surface that has little sand. It is crescent- or U-shaped, with narrow tips pointing down wind. Transverse dunes are only slightly crescent- shaped, and they occur where there is an abundant supply of sand. Transverse dunes often form fields of wavelike sand dunes whose slip faces consistently face the same direction. Seif dunes form in a generally parallel arrangement. Seif is the Arabic word meaning “sword,” an apt expression for this long narrow dune. Seif dunes can be tens of kilometers in length and several tens of meters high. Seifs have multifaceted slip faces, as variable wind directions affect them. The changeable winds cause the dunes to migrate in the direction of their longitudinal axes. For this reason, geomorphologists refer to seifs as longitudinal dunes. Variable winds cause star dunes to have even more complex slip faces than longitudinal dunes: star dunes have central peaks from which several crests (arms) radiate. Coastal dunes are usually of the parabolic type as sea breezes imprint a subtle parabola (bowl) shape on the dunes’ back slopes. This depression gives the parabolic dune a U-shape plan in which the arms point upwind. Winds from powerful storms that form over the ocean sometimes accentuate parabolic depressions by creating blowouts—dunes with very deep excavations in their back slopes.